New command added: GT_TXTEVAL : (GeoTools -> Text Tools -> Apply arithmetic / statistical operations on text objects): The GT_TXTEVAL command allows you to select text objects representing numbers and apply a number of arithmetic or statictsical operations on them - like arithmetic/geometric/harmonic mean, median, mode, highest, lowest, summation, standard deviation etc. The result is reported on the screen as well as created as a text object. This command can work on values taken off block attributes as well. Enhanced command: GT_BATCHPROCESS (GeoTools -> Miscellaneous Tools -> Batch process multiple drawings with scripts): The GT_BATCHPROCESS command can now do a recursive search starting from the selected folder and all folders below it and will create a BATch file to process all the files in one go. The earlier method of selecting one folder and drawings within the folder is still available. Enhanced command : GT_PARTOFFSET (GeoTools -> Polyline Tool Set1 -> Offset part of a polyline): This command now handles 3d polylines fully and the offsetted segment also is a 3d polyline. Earlier, partial offsets from a 3d polyline would result in a 2d polyline. Bug Fix: GT_QUERYPROC (GeoTools -> AutoCAD Map Tools -> Format text labels queried with 'Alter properties'): The GT_QUERYPROC command was not doing an offset of the queried labels by the specified amount in case of linear queried objects. This has now been fixed. 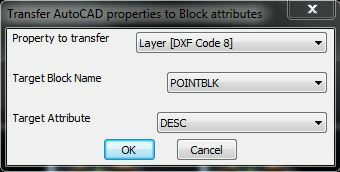 Labels queried with 'Alter properties' Query in AutoCAD Map now can be fully controlled - justification, position, direction, XOffset, YOffset etc. New command added(12.09): GT_PROP2ATT : (GeoTools -> Blocks Tools -> Transfer AutoCAD properties to block attributes): The GT_PROP2ATT command allows object properties from blocks to be transferred as attribute data. This command is very similar in design to the GT_PROP2OD command which transfers AutoCAD properties into Object data. New command added (12.08): GT_UPDATEPOINTBLK : (GeoTools -> Blocks Tools -> Update 'Coordinates Block' attributes): Surveyors often use a point block containing Easting, Northing, Elevation as attributes. You can populate such attributes using the GT_UPDATEPOINTBLK command. There is an ongoing promotion, exclusively for India, which gets you all licenses of Bricscad at about 30% off the list price. On top of that, a new promotion has been announced by Bricsys today, valid until July 31, 2011. "We now have a one-time offer to buy the latest Bricscad Platinum technology for an unique price: get the Platinum version for the price of a PRO version! This translates into the following prices for Bricscad Platinum in India, until July 31, 2011. ", says a release from Bricsys. If you are sitting on the fence, and have not yet made up your mind, now is the time. GT_VIEWLINKED command (GeoTools -> Export Tools -> View handles-linked ASCII data) : The GT_VIEWLINKED command populates all records from the ASCII file into the dialog box. However, in Bricscad, there is a bug which causes a huge performance loss when trying to populate large number of records into the popup list of the dialog box. To prevent this, the GT_VIEWLINKED command will list only the first 3000 records of the ASCII file in the dialog box in Bricscad.